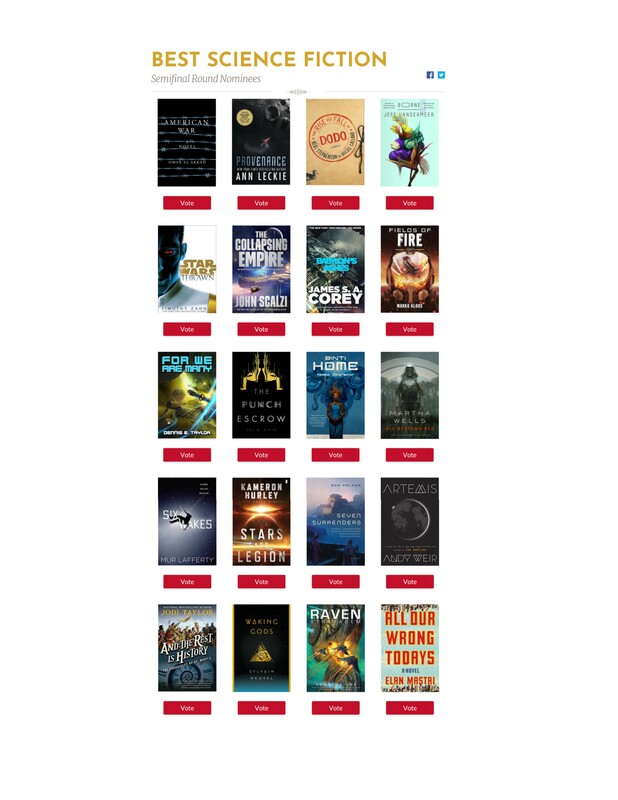 Voting has begun in the semifinal round of the Goodreads Choice Awards: The Best Books 2017 and will continue through November 12. 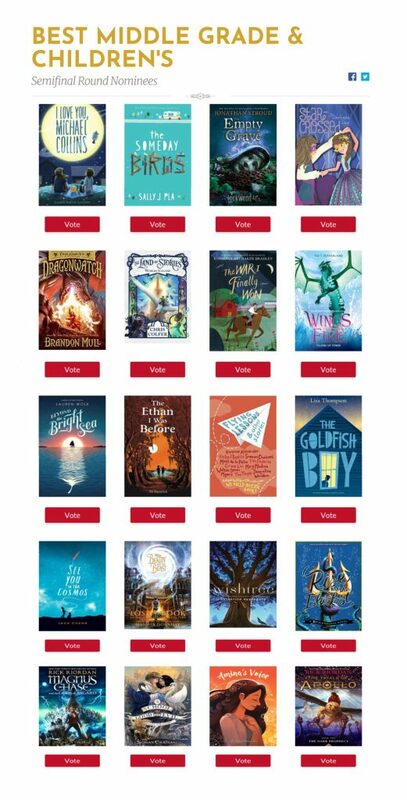 Here is what Goodreads voters picked in the categories of genre interest, including any entries added by write-ins, which were allowed in the opening round. This entry was posted in Awards and tagged Goodreads, Goodreads Choice Awards by Mike Glyer. Bookmark the permalink. 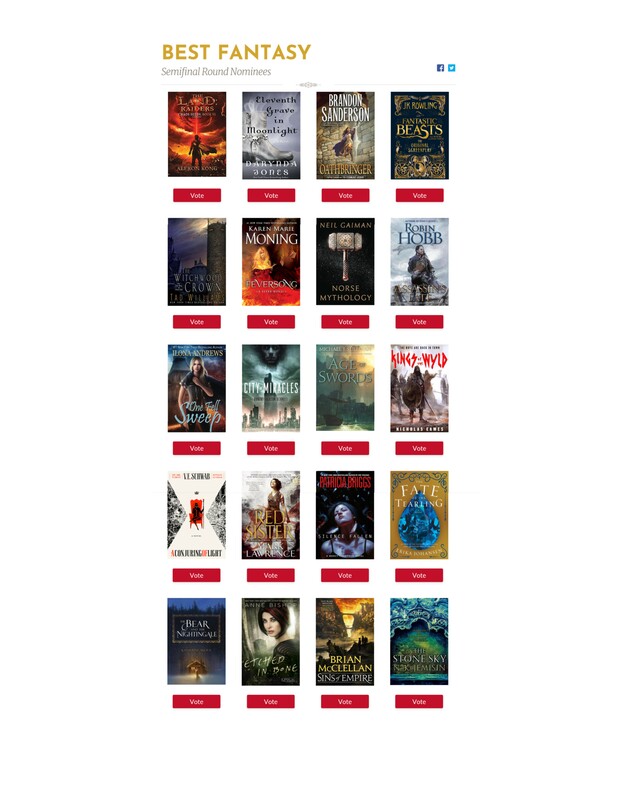 The Rise and Fall of D.O.D.O and The Stars are Legion are the only successful write-ins I’ve read, although City of Miracles and Six Wakes are on the tbr. I’m surprised the Sanderson and the Joe Hill weren’t on the original shortlist tbh. Sanderson’s Oathbringer is another one that won’t be released until Nov 14. Interesting, thanks. Those who wrote it in are unlikely to have actually read it in full then – I see that tor.com is serializing it as a preview right now but it’s not fully released yet. Yes, Tor has put quite a few chapters up. But I believe it’s such a monster-size book that it’s still a relatively small sample of the whole. @Mark Meddling Kids was in the original open round. There are some really hard choices to make in this round. Some I loved for different reasons and I don’t want to choose between them! Ooops. I listed six in horror instead of five, so I really ought to have caught that! 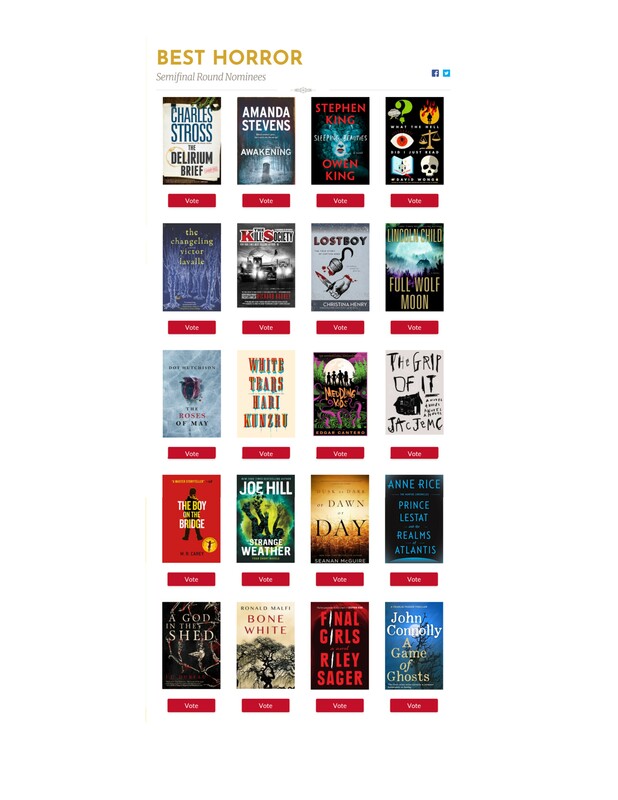 It’s ridiculous that books that aren’t out yet are on the list. And dishonest and unfair to vote for something you haven’t read. And yeah, hard to choose between the Schwab and the Bennett. Apparently, Oathbringer just makes the eligibility list, even though it won’t have been officially published during the first two rounds. 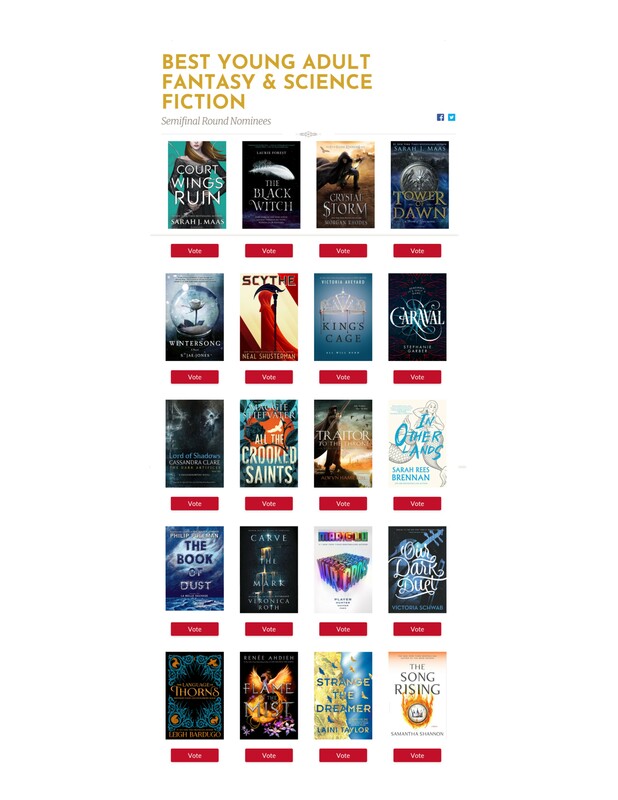 At least people can have read the first 32 chapters of Oathbringer on Tor.com before voting. Artemis won’t even have been released. I started out pulling data for my assumption that Rowling will steamroller fantasy anyway – Harry Potter and the Cursed Child got 41% of the vote in Fantasy last year, more than the next six places combined. For particularly viral books, there appears to be a “this is the only book I’ve read/heard of in this category” effect. But some of the other data geeking is interesting too – by my count at least 5 of the 20 categories in 2015 have a winner that has more votes than reader ratings. My favorite would have to be the category where the top five vote-getters have about half or fewer the corresponding number of ratings, while the sixth vote-getter has more ratings than the total number of votes for the category. So the winner couldn’t be either the favorite-read or the only-read in the category – a “favorite blurb” contest? I’m fine with the existence of popular vote awards, and happy to mull their results, but I’m glad we have other kinds of awards too. 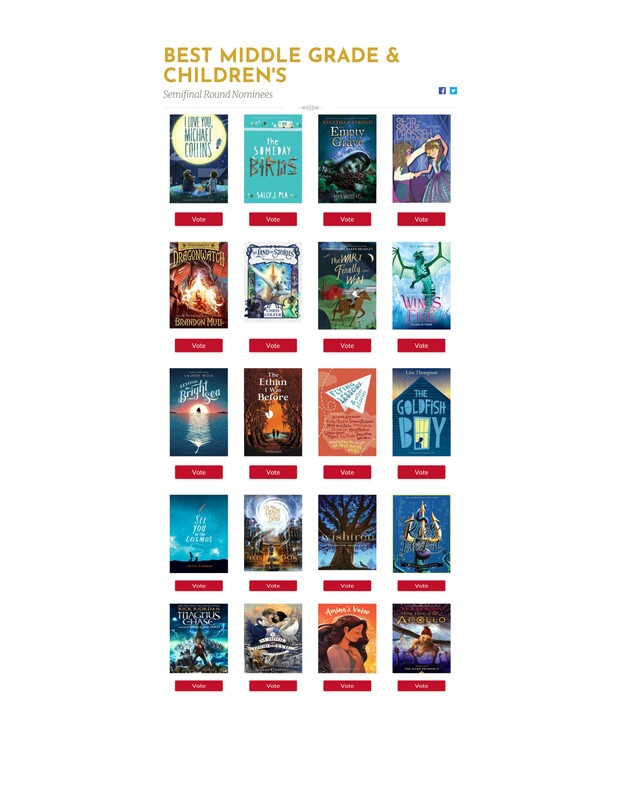 Per Mark’s comment, I think next year I’ll try to capture the opening round lists so I can see what the write-ins are – I feel like there are some interesting books in those subsets, especially SF. 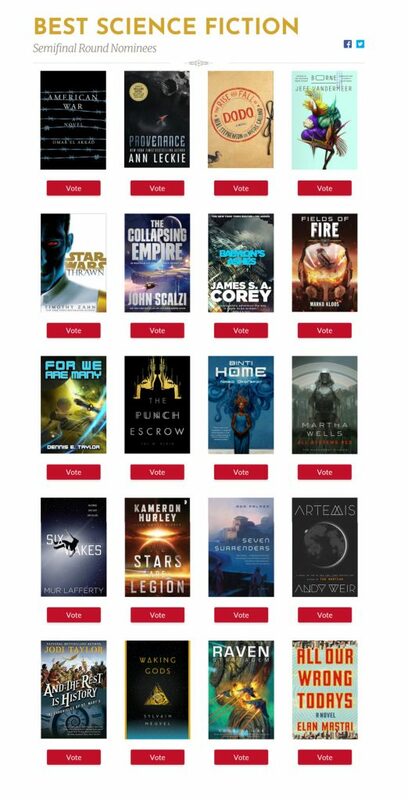 I am really pleased to see that Six Wakes, City of Miracles, and The Stars are Legion have been added to the finalists. I’ve read 9 of the SF books, and am just starting the 10th. The added write-in finalists can be determined by comparing this list to the list in Mike’s post on the preliminary finalists. Not surprising things have more votes than ratings. I only use Goodreads to keep track of my short fiction reading. So none of my votes have corresponding ratings. But I have read all of the books I voted for. The Goodreadsawards are interesting. Good choices and nearly every work that I know of would be something that is at last an okay winner. The should change the rules that books have to be out for round 1, everything else should be eligible next year. Four of the SF write-ins are the sort of thing that is popular among Hugo people, but what do people know about The Punch Escrow? I added “The Punch Escrow” to Mount Tsundoku based on the Big Idea writeup on John Scalzi’s blog. From the blurb, it’s a near-future story about mass-scale, commercial teleportation. The process has some issues the company doesn’t want anyone to know about. I see that The Punch Escrow is also a Geek and Sundry/Inkshares book, and we’ve seen their ability to mobilise a fanbase. 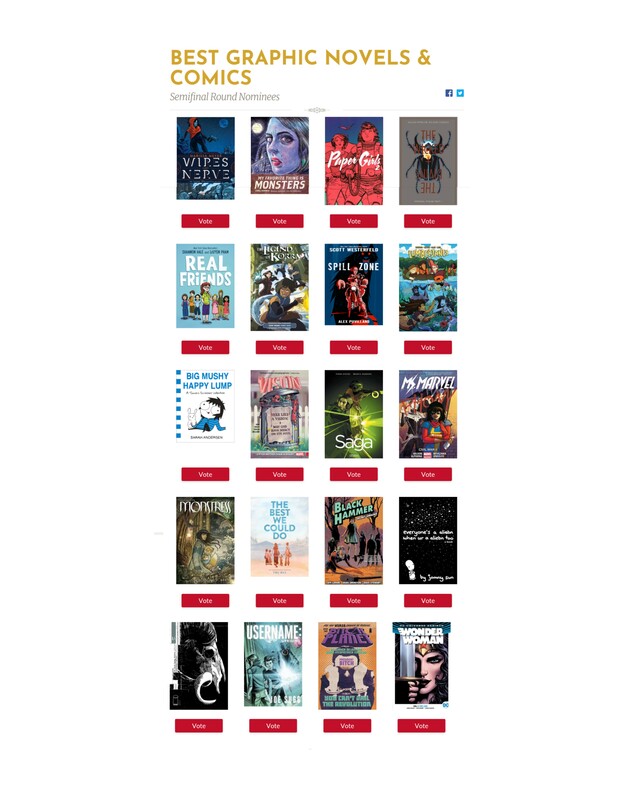 Might be worth noting that Michael Chabon’s Moonglow is on the list in the Historical Fiction category.